The Edmonton Oilers have obtained left wing Sergei Samsonov from the Boston Bruins in exchange for Marty Reasoner, Yan Stastny and a second round draft choice in the 2006 NHL Entry Draft. Samsonov, the 1998 Calder Trophy winner as the NHLs Rookie of the Year, has scored 18-19-37 with 22 penalty minutes with the Bruins this season and is two goals shy of his fifth 20-goal season. He has scored six powerplay goals and one game-winning goal. Listen to the full press conference with Kevin Lowe after the Samsonov trade was announced. 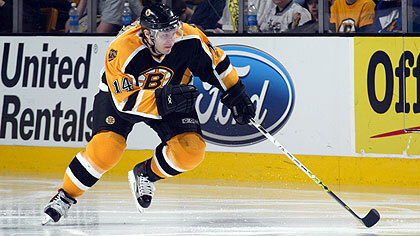 The 58", 194-pound native of Moscow, Russia is in his 8th NHL season since making his debut with Boston in 1997-98. Samsonov has twice scored 29 goals, netting a career-high 29-46-75 in 2000-01 and 29-41-70 in 2001-02. 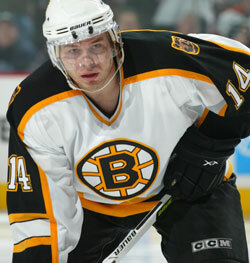 In 514 career NHL games with Boston, he has scored 164-212-376 with 103 penalty minutes. The 27-year-old forward became only the second player in NHL history to win rookie of the year honours in a minor pro league and then win the Calder Trophy in consecutive seasons. Samsonov was named the International Hockey Leagues rookie of the year in 1996-97 when he scored 29-35-64 in 73 games for the Detroit Vipers and then won the Calder Trophy with Boston in 1998. (Roger Crozier was the AHLs rookie of the year in 1963-64 and won the Calder Trophy in 1964-65.) He was also named to the 1997-98 NHL All-Rookie Team. A veteran of the CSKA Red Army team in Russia, Samsonov won a bronze medal with Team Russia at the 2002 Winter Olympics in Salt Lake City and was a member of the Russian team at the 2004 World Cup. He also represented his country at the World Junior Championships in 1996 and 1997, winning a bronze medal in 1997.